On Buchanan and Press, MSNBC’s imitation of CNN’s Crossfire, both the rightwing Buchanan and the leftwing Bill Press agreed that the United States should not attack Iraq. Opposition to Zionist or pro-Zionist aggression seems to have been more or less the established view at MSNBC when Buchanan started there. In addition to Pat Buchanan and Press, MSNBC’s Phil Donahue and Chris Matthews were dishing out skepticism of the justifications for war on a regular basis. Since the current president of MSNBC, Phil Griffin, was the producer of Hardball with Chris Matthews during its strongest anti-war period, and since Griffin was also a longtime personal friend of Keith Olbermann’s from the 1980s when they both worked at CNN, it would appear that Griffin does not have any objection to airing anti-war commentary. Shortly before the invasion of Iraq in early 2003 — for some unknown reason — MSNBC suddenly made a drastic change in its prime-time schedule that brought the channel’s programming more into line with the course of action that the government was about to pursue. Chris Matthews, moved to an inferior time-slot where his tone was much more subdued. Phil Donahue, gone. In time, however, Griffin’s friend Keith Olbermann (a Unitarian of German ethnicity) became as strong a critic of Middle-East warmongering as Phil Donahue, whose former time-slot he occupied, had ever been. Increasing Political Correctness at MSNBC? One theory about Buchanan’s departure from MSNBC is that it was the result of a leftward shift in the range of political expression deemed acceptable at the station. Brian Stelter, writing in the New York Times on 16 February 2012, notes that when Buchanan was hired at MSNBC in 2002 the channel called itself “fiercely independent” and had no clear political tilt, but that the channel has increasingly tilted to the left in recent years, causing Buchanan to appear out of place. This shift to the left was initiated by Phil Griffin, who became president of MSNBC in 2005. Griffin initiated a publicity campaign called “Lean Forward” that seems to be designed to solidify MSNBC’s image as a leftist channel. The campaign features spots directed by Spike Lee. One features Al Sharpton vaguely attacking the Republican Party. The general theme of “Lean Forward” seems to be optimism about the future of the United States on a multiracial basis. Griffin seems to be trying to copy Fox News’ accomplishment in developing a cultlike viewership: “I’m impressed with how they’ve created a following…So I tip my hat to Fox.” That might mean excluding anything that would displease the defined audience: “We’re niche. We exist on a media landscape where you can get so much. We’ve carved out an area that’s smart, that’s really thoughtful, that really wants depth, not breadth….” (Mediaite, 25 July 2011) So, MSNBC now, more than in the past, caters to a “niche” that regards itself as smarter than the rest and is not interested in “breadth.” MSNBC thus shed its former eclecticism and became more like a leftist version of Fox News. Practical manifestations of “Lean Forward” presumably affected programming decisions, like hiring a very overt butch lesbian as a political analyst in 2008, and making loose-cannon Black agitator Al Sharpton the host of his own show in 2011. While doctrinaire leftist “lean forward” zealotry had taken charge at MSNBC, Buchanan stayed the same, which may have made the tenability of his position there questionable. At least that’s one theory. Why this shift would have taken so long to affect Buchanan’s position is hard to say. Buchanan was hardly politically correct on racial or sexual issues before Suicide of a Superpower. In his acceptance-speech for the presidential nomination of the Reform Party in 1996, Buchanan advocated that Affirmative Action be abolished. In 2008 Buchanan defended Geraldine Ferraro’s statement that Barack Obama’s being Black had contributed to his political prominence. In 2009 he criticized the Sotomayor nomination to the Supreme Court as Affirmative Action and discrimination against White males, so forcefully that he brought Rachel Maddow to the verge of tears. Phil Griffin’s star and favorite at MSNBC happens to be butch lesbian Rachel Maddow. 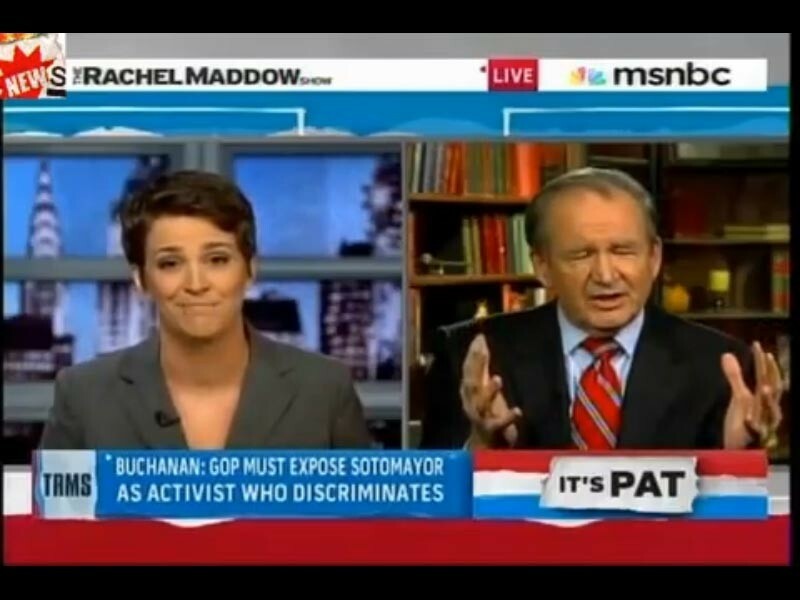 On 16 July 2009, Rachel Maddow had Buchanan on her show to discuss a column that he had written about what the Republican position on the Supreme Court nomination of Sonia Sotomayor should be. Maddow admits to having some Jewish ancestry and is classified by Jew or Not Jew as “barely a Jew.” She does not seem to be very critical of the ways in which news about Israel is generally reported. In regard to Operation Cast Lead her statements were entirely kosher and uncritical (making her a target of some criticism in the leftist blogosphere). This contrasts sharply with Buchanan’s description of Gaza as a giant concentration camp, which got him intense expressions of hostility from, e.g., Michael Savage (né Weiner). Where Rachel Maddow repeated the Israeli government’s claim that nine Israeli citizens had been killed by rockets from Gaza, Buchanan said that the little rockets hadn’t killed anybody. Where Maddow was Israel-friendly, Buchanan condemned. Since Griffin’s star, Maddow, is a very overt lesbian, it is conceivable that Buchanan’s opposition to normalizing homosexuality had special importance in his demise at MSNBC, although as in other matters, this is nothing new with him. In Summer 2011 Al Sharpton was brought onto MSNBC as the host of PoliticsNation, after the acrimonious departure of Cenk Uygur. These days Sharpton is a judas-goat to the Black population of the United States, used to convince them that further non-White immigration is something that they should support, even though it is clearly going to be ruinous for them. In August 2011 Buchanan accidentally knocked a chip off Al Sharpton’s shoulder by referring to Barack Obama as “your boy.” To a political left that prides itself on verbal sensitivity, this seemed unbelievably gauche. While MSNBC’s straight, non-Jewish, and White personalities lamented Buchanan’s dismissal — Chris Matthews said, “I miss him already,” while Joe Scarborough, and Mika Brzezinski publicly stated that they “strongly disagree” with their employer’s decision — Rachel Maddow seems to have kept mum. Likewise Al Sharpton. Friction with Rachel Maddow and Al Sharpton, members of cherished minorities, may have been a factor in Buchanan’s dismissal. Even while criticism of Israel-Firstism has a home on the doctrinaire left, not going along with the Black agenda and condemnation of perversion do not. If we accept as convincing Liz Trotta’s tirade on Fox News about Buchanan’s dismissal, that it was because MSNBC had become “close to being a Communist network,” then we have to look for which people at MSNBC agitated for Buchanan’s downfall, since certainly not everybody there agreed with it. The fact that Buchanan was in ideological conflict with others at MSNBC is not a new fact, nor is the conflict obviously starker than a few years ago, nor, given that Phil Griffin was to some extent using Fox News as his model, does eliminating MSNBC’s devil’s advocate (or God’s advocate, in this case) seem to make sense as a programming decision. Buchanan’s dismissal may not have had anything to do with leftism. A significant public agitation for Buchanan’s dismissal from MSNBC commenced in May 2009 when the new counsel to the World Jewish Congress, Menachem Z. Rosensaft, complained that there were expressions of Holocaust-skepticism (featuring me) on the forum at Buchanan.org. The issue of the forum was obviously not the real grievance against Buchanan, since the forum had only one thread on that topic, with comments going both ways, with no statements from Buchanan himself and strict neutrality by the administrator, Linda Muller. Rosensaft was conjuring a real tempest in a teapot. Obviously the long list of other Jewish, and especially Zionist, grievances against Buchanan, including at that time his renewed defense of John Demjanjuk, were much more of a factor than a single thread on a forum. Rosensaft’s agitation caused a big enough scare that the forum at Buchanan.org was completely removed for some months, and was eventually brought back only with strict control of content. It is probably fair to say that Media Matters and Color of Change, given so much prominence in discussions of Buchanan’s downfall, are pipsqueaks compared to the World Jewish Congress. Yet even this did not get Buchanan fired – at least not for well over two years. While Zionists were certainly no friends to Pat Buchanan, they may have found a way to affect him other than through public agitations and letter-wrting campaigns. Cenk Uygur, the “Young Turk” who hosted PoliticsNation for a time and departed in July 2011 on bad terms with MSNBC, says that “people in Washington” have a say in MSNBC’s programming decisions, and that this input from Washington completely overrides considerations such as popularity of a show or a personality. News-organizations are effectively in bed with the government, somewhat by necessity, because in order to report the news they need access that the government can deny them. Uygur’s revelation explains much. It explains why in 2003 MSNBC suddenly, just before the invasion of Iraq, changed its primetime schedule, eliminating the anti-war Phil Donahue and moving the anti-war Chris Matthews to a slot where his ratings were significantly reduced, while bringing on warmongers Michael Savage and Joe Scarborough. In retrospect it is obvious: there was going to be a war and somebody in the government sent word that MSNBC would have to get with the program or it would have difficulty getting access and information. Of course ultimately we know whose agenda has been dominating the Executive Branch of the United States, who has been behind these Middle-East wars, and who therefore the “people in Washington” are. With Barack Obama, no less than with George W. Bush, the most influential “people in Washington” seem to be Zionist Jews. The reason for Pat Buchanan’s dismissal from MSNBC thus may have had little to do with his complaints about demographic changes in the United States and everything to do with the fact that Buchanan was inconvenient for the “people in Washington” — for the Israel-Firsters and the foreign policy that they intend to pursue. With that, we can regard the cancellation of Andrew Napolitano’s Freedom Watch by Fox News at about the same time (after Napolitano alluded to the hidden unity of the two major political parties and endorsed Ron Paul for president) as having the same explanation, just as the Israel-Firsters and their agenda were the real explanation for the dismissal of Glenn Beck.